It was a good year for music in Indian Country with new releases coming from every corner of Turtle Island and in every genre you can imagine. LPs, EPs, singles, mixtapes, remixes - we've heard most of it here at RPM and while it's difficult to say what the best albums of the year are, we've tallied up the records we think have been the most influential. These albums made a splash on the scene, presented a new perspective, reached new heights in production and creativity, or attained a new level of work for the artist. Blue King Brown - Blue King Brown (BKB) BKB ripped through Canada with their first Canadian release (self-titled) this past summer. Their fearless approach to global issues and energetic combination of live urban roots music is sure to have taken many Turtle Island fans. With front woman Natalie Pa’apa’a (Samoa) leading the pack with her pint-size ball of fire attitude, their shows get you moving and their album will hopefully inspire more local Indigenous folks to take their messages to the dance floor. One of our favorite tracks is Come and Check Your Head with lyrics "'Cause this battle’s about to get hotter, I feel it in my heart! AND next time you're waiting for something to change, Instead of just sitting and wasting the day, The struggle it breathes now and calls out your name." Yep. Label: Indica. Get Blue King Brown on iTunes. Winnipeg's Most - Goodfellaz The trio of Winnipeg's Most definitely made HUGE leaps and bounds this year with their multiple video releases and the literal clean-up of Aboriginal People's Choice Awards. Their album Goodfellaz took home 6 awards this year and yielded a handful of quality music videos that all garnered huge hits on YouTube. These guys don't seem to be slowing down at all and are continuing to release more music every month. Label: Heatbag Records/Rezofficial Music. Get Goodfellaz on iTunes. Terri-Lynn Williams-Davidson - New Journeys This album in the Haida language aims to start a new journey for Haida music. Through combining contemporary instrumentation with traditional, Terri-Lynn Williams-Davidson establishes a connection to Haida culture that some may not find in a more traditional format. Most of the songs are original compositions, the production of which is beautiful, stirring and meditative. Williams-Davidson's voice is soft and strong and even if you don't understand the words, deeply moving in its delivery. Music is surely one of the best methods of using and preserving language, and in New Journeys - which won Williams-Davidson Best Female Artists of 2011 at the Canadian Aboriginal Music Awards - Williams-Davdison brings the language not only to the present time but also straight to the heart. Label: Raven Calling Productions. Get New Journeys on CDBaby. The Local Onlyz - Kings Among Clowns Bringing some funk and hip-hop into the world of Indigneous music, The Local Onlyz hit it off this year with their album King's Among Clowns. Starting with a great video for their song Next To You, their album brought a new breath of energy to the table. Mixing the styles of live instrumented hip-hop with frontman Infored's technically savvy rap style, brought them out to Aboriginal Music Week and also onto our most influential albums list for 2011. Label: Independent. Hear Kings Among Clowns on SoundCloud. Vince Fontaine - Songs for Turtle Island Ojibway musician Vince Fontaine is best known as the founder of and guitarist for rock band Eagle & Hawk who have been successfully making music together for 16 years. 2011 was the year that Fontaine, for the first time, went solo. 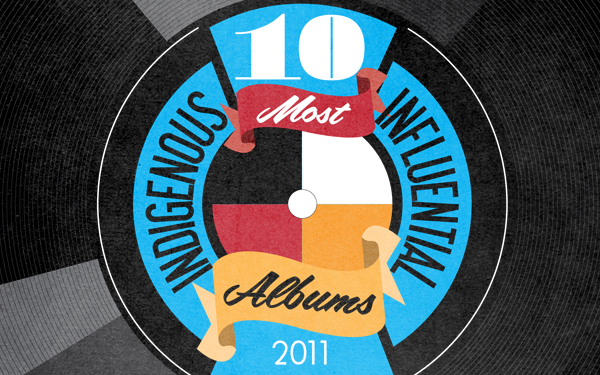 Songs for Turtle Island has collected a list of well-deserved award nominations and wins, including winning Best Instrumental at the Aboriginal Peoples Choice Music Awards and Native American Music Awards and Best Songwriter at the Canadian Aboriginal Music Awards, in 2011. It's not hard to hear why the praises are being sung - the 8 songs on Songs for Turtle Island are an eclectic but cohesive fusion of contemporary instrumental genres with traditional Native American music, from atmospheric electronic instrumentation to hand drum. The result is unique, captivating and one of this year's best albums. Label: Rising Sun Productions. Get Songs for Turtle Island on CDBaby. 1491 Nation Presents: MC RedCloud Though this is a mixtape, this album made major waves in the Indigenous hip-hop scene. MC RedCloud has been touring and collaborating all over Turtle Island for the last decade, bringing his energetic unmatched rap skills to stages in both Canada and the United States sides of the border. 1491 Nation Presents: MC RedCloud brought us back to a time in hip-hop that was all about the beats and rhymes, that was a great gift to the ears of hip-hop listeners this summer. Filled with comedy skits and solid songs in the classic RedCloud style, this is an album that you should get right now if you don't have it already. Label: Independent. Get 1491 Nation Presents: MC RedCloud on Bandcamp. Silver Jackson - It's Glimmering Now Following his release of the experimental hip-hop EP Digital Indigenous under the moniker of Indian Nick in April this year, Nicholas Galanin turned to his more acoustic persona Silver Jackson and released It's Glimmering Now in November. That said, in the past Silver Jackson has been a more bluesy, folky side of Galanin but with It's Glimmering Now his sonic pursuits seem to be coming closer together. It's a welcome contribution of experimental and acoustic vibe on a music scene that can be saturated with hip-hop and country, displaying the best of the diversity in Indigenous music culture today. With each listen, you'll hear something you didn't on your last, which is to say it's a grower and an aural landscape to explore. So get in there and look around. Label: Homeskillet Records. Get It's Glimmering Now on Bandcamp. Laura Ortman - Someday We'll Be Together This summer Laura Ortman released her second solo album Someday We'll Be Together which features her on vocals, violin, piano, electric guitar, Apache violin (a long hollowed out Agave stalk with both the string and the bow hairs made of horse tail hair), Casio, and tree branches. Her classical training combined with her adventurous heart lead us on a magical, spaced out adventure through New York. Check out our recent RPM spotlight on her. Label: Lightning Speak. Get Someday We'll Be Together on Bandcamp. Beaatz - Music Is Me let's include a mention that we included him in our 4 to watch in 2012 We cannot say enough about the introduction of Tobique First Nation's Beaatz. He stepped onto the hip-hop scene this year with an undeniable hip-hop sound that makes you say, "This kid is from WHERE?!?!?". His debut album Music Is Me was released earlier this year and has all the makings to be a classic that he decided to release for FREE download. His skilled production and rap ability will always ensure him a place at the table for the years to come. Label: Independent. Get Music is Me via MegaUpload. Phyllis Sinclair - Dreams of the Washerwoman Winner of Best Folk Acoustic Album at this year's Canadian Aboriginal Music Awards, Dreams of the Washerwomanis the third album from swampy Cree singer-songwriter Phyllis Sinclair. With this release, she has honed and deepened her songwriting and performance, the result of which is 10 strong songs, each featuring beautiful melodies and striking imagery. Dedicating the album to single parent families, the true heart of the album is the stories Sinclair shares - drawing from her own experiences of being raised in poverty by a single mother, she speaks to struggle and perseverance with compassion and wisdom. Dreams of the Washerwoman is a benchmark for Sinclair and a work that stands out within the singer-songwriter genre. Label: Independent. Get Dreams of the Washerwoman on CDBaby.